CRAZY DISCOUNT! Was: $199.95 Now: $139.97! Fence up the little crawling or toddling adventurer against harmful elements with our 3 in 1 baby playpen. Constructed in eco-friendly and sturdy metal with striking white finish, the baby gate is secure and durable to use and will blend with any home decor. 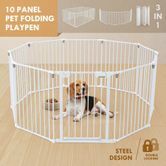 The playpen features ten easy-to-adjust panels which ensure you to arrange into various shapes and mount to any area of your house like stairs, fireplace or wall effortlessly. 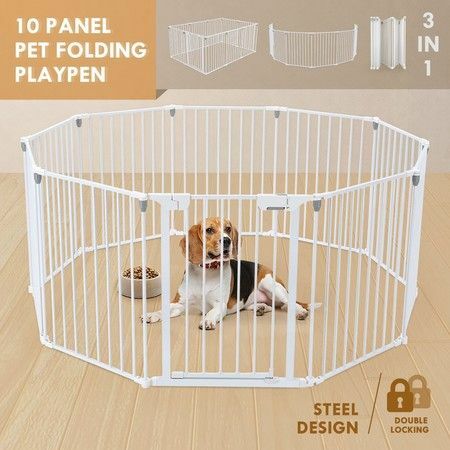 Crafted from double lock with automatic open and close configuration, the kids playpen allows for easy in and out and guarantees your baby safety. Set up the safety gates at anywhere you needed to create a playground for your little ones. 174 x 117 x 74cm approx. Item as described and well package.